"Sometimes I could cope with the sullen despair that overwhelmed me, but sometimes the whirlwind passions of my soul drove me to seek, by bodily exercise and by change of place, some relief from my intolerable sensations. It was during an access of this kind that I suddenly left my home, and bending my steps towards the near Alpine valleys, sought in the magnificence, the eternity of such scenes, to forget myself and my ephemeral, because human, sorrows. My wanderings were directed towards the valley of Chamounix. I had visited it frequently during my boyhood. Six years had passed since then: I was a wreck, but nought had changed in those savage and enduring scenes. Adolphe Appian was both the student and friend of Corot and Daubigny. One of the masters of 19th-century landscape etching, his works show the influence of Japanese art and have been included in shows on "Japonisme" at museums such as the Rijksmuseum in Amsterdam and the Metropolitan Museum of Art. In addition to Appian, our selections of landscapes by artists working in the 19th century includes prints by the the Impressionists and Post-Impressionists. We also have a number of drawings and gouaches by artists including the ever popular anonymous, hard at work in a number of different genres and with results varying from work to work. Someare no more than a travel record, others quick sketches from life, others still, ways of thinking about possible ways to lay out a composition, yet still others finished works of art serving not only as a model for another work but as independent, polished pieces capable of standing on their own. Some of these artists are anonymous because they never had any desire to be thought of as artists; others because they feared that the little they knew about how to draw could serve to help them remember something they wanted to remember but feared that publicly releasing them might bring them unflattering public attention. Others are by professional artists, sometimes continuing a long-time family trade, sometimes immensely successful, sometimes barely known. We have identified works by Hans (Johann) Beckmann, Theophile Chauvel, Heloise Suzanne Colin, Felix O. C. Darley, the Count D'Orsay, E. F. Gehme, Emil Kinkelin, Johann Mader, Mauer, Lothar Meggendorfer, Adrian Ludwig Richter, Marianne von Rohden, Otto Steiner, and Adalbert Wolfe. Pres de Rix / Near Rix (Curtis & Prouté 16). 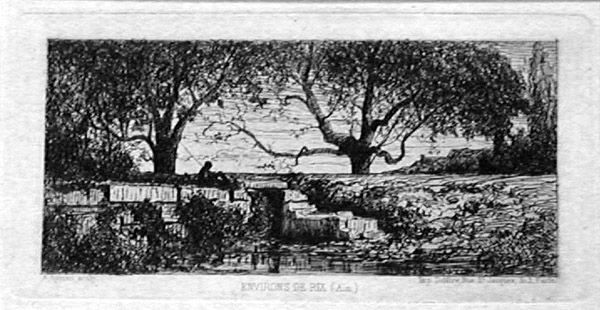 Original etching, 1862. Edition unknown. Published in the deluxe edition (c. 500 impressions) of Philip Hamerton's Etchers and Etching, 1868. 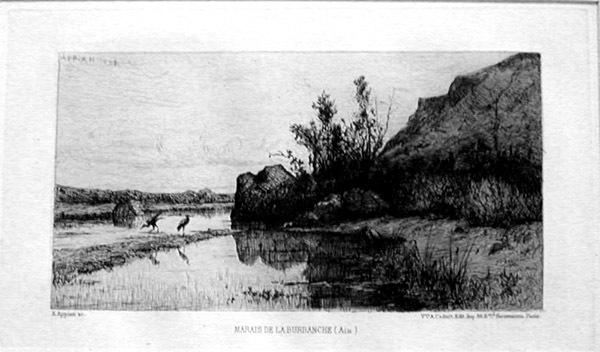 Later editions did not contain this etching. A print catalogue from Emmet Steele (5/96) calls this work "very rare." Signed in the plate. Image size: 87x174mm. Price: $625. Marais de la Burbanche (Ain) / Swamp of the Burbanche. Original etching, 1863. Published by Cadart, 1868. Signed in the plate. One of Appian's most beautiful images. Image size:116x200mm. Price: $675. 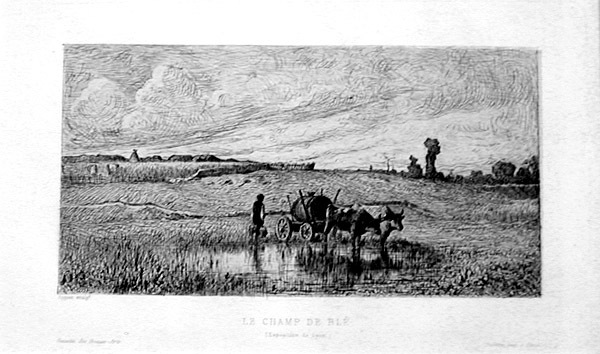 Le champ de Blé / The field at Blé. Original etching, 1863. Published in the Gazette des Beaux Arts, 1863. Signed in the plate. Image size: 99x188mm. Price: $675. To purchase, call us at 1-800-809-3343 (1-508-529-2511 in Upton MA & vicinity) or send an email to spaightwood@gmail.com. We accept AmericanExpress, DiscoverCard, MasterCard, Visa, and PayPal. Visiting hours: Noon to six Saturdays and Sundays; other times by arrangement.